The invention of the telephone is credited to both Alexander Graham Bell and Antonio Meucci. Antonio Meucci is said to have invented a tool for voice communication in the year 1854, and Bell had the first patented design. 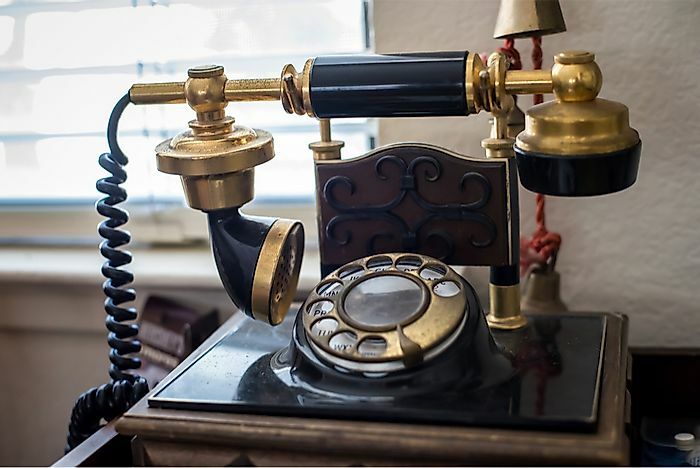 Various forms of the telephone have existed since it was first patented in the United States in 1876. Born on March 3, 1847, Alexander Graham Bell was an inventor, scientist, and innovator. He came up with and patented the first practical telephone. Bell’s father and grandfather engaged in a speech development program known as elocution, and as a result, Bell was inspired to study communication and speech. Bell’s extensive research work was also strongly influenced by the fact that his mother and wife were deaf. Although Bell patented the electromagnetic transfer of vocal sound, Antonio Meucci is credited as having created the very first telephone. Bell was born in Edinburg, Scotland to Eliza Grace and Professor Alexander Melville Bell. He had two brothers, Melville and Edward Bell. Bell received early schooling from his father, and then proceeded to study at the Royal High School Edinburg Scotland until the age of 15. While at school, Bell did not take much interest in any other subjects apart from the sciences. After completing high school, Bell went to live with his grandfather in London. At the age of 17, Bell joined the University of Edinburg, but did not write his exams at the specified time since he and his family moved to Canada. When he finally completed his exams, he passed and was admitted at the University College of London. Bell was married to Mabel Hubbard on July 11, 1877. Bell was naturally curious of his surroundings from a very young age. He even created a simple de-husking device at the age of 12. The device was used for many year’s at his friend’s family grain mill. He then started showing interest in sound and sound devices. In 1863, Bell’s father arranged a trip for Bell to see an automaton. It had been developed by Sir Charles Whitestone. The machine, which simulated human voice, impressed the young Bell, who later became a professor in elocution at Boston University. Subsequently, Bell started performing experiments on sound and even built his first automaton head. Alexander eventually began using electricity to transmit sound, and also installed a telegraph wire to assist in his experiments of transmitting sound from one place to another. By 1874, Bell’s experiments became greatly successful. One such experiment was on the phonautograph, which was a machine that could use vibrations to draw shapes on a piece of glass. In 1875, Bell developed an acoustic telegraph (telephone) and applied for it to be patented. Afterwards, on March 10, 1876, he succeeded in making his telephone work. Subsequently, over 145,000 people in the United States possessed a telephone by 1886. The invention of the telephone received various awards such as the Albert Medal, the John Fritz Medal, and the Eliot Cresson Medal . Bell died on August 2, 1922 at his estate in Cape Breton, Nova Scotia, after battling diabetes. The Bell Memorial stands in Brantford, Ontario to commemorate the invention of the telephone by Alexander Graham Bell.